If you’re headed to Nairobi and have a passion for African wildlife, you’ll want to make time for a visit to the capital’s famous Giraffe Centre. 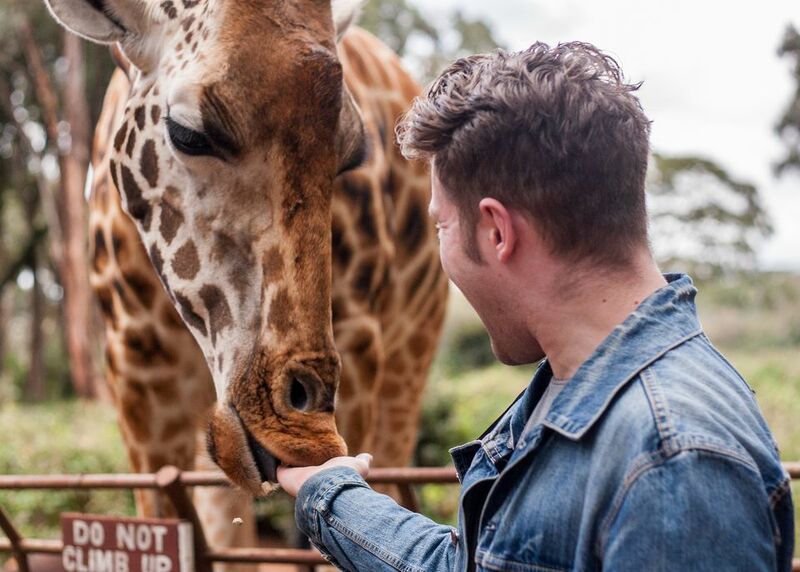 Founded and run by the African Fund for Endangered Wildlife (AFEW), the center is undoubtedly one of Nairobi’s best-loved attractions. Originally set up as a breeding program for the endangered Rothschild’s giraffe, the center offers visitors the opportunity to get up close and personal with these magnificent creatures. Also known as the Baringo or Ugandan giraffe, the Rothschild’s giraffe is easily identified from other subspecies by the fact that it has no markings below the knee and its spots are varied in shape and are composed of two tones. In the wild, they are found only in Kenya and Uganda, with the best places for potential sightings including Lake Nakuru National Park and Murchison Falls National Park. However, with numbers in the wild still so low, the Giraffe Centre remains your best bet for a close encounter. The Giraffe Centre started life in 1979, when it was founded as a breeding program for Rothschild’s giraffes by Jock Leslie-Melville, the Kenyan grandson of a Scottish Earl and his wife, Betty. The Leslie-Melvilles decided to remedy the decline of the subspecies, which had been driven to the brink of extinction by habitat loss in western Kenya. In 1979, it was estimated that there were only 130 Rothschild’s giraffes remaining in the wild there. The Leslie-Melvilles started the breeding programme with two captured baby giraffes, which they hand-reared at their home in Lang'ata, the site of the current center. Over the years, the center has successfully reintroduced breeding pairs of Rothschild’s giraffes to several Kenyan national parks, including Ruma National Park and Lake Nakuru National Park. Through the efforts of programs like this one, the population of wild Rothschild’s giraffe has now risen to around 1,500 individuals. In 1983, the Leslie-Melvilles completed work on an environmental education and visitor’s center, which was opened to the general public for the first time later that same year. Through this new initiative, the center’s founders hoped to spread awareness of the subspecies’ plight to a much wider audience. Today, the Giraffe Centre is a non-profit organization with the dual purpose of breeding giraffes and promoting conservation education. In particular, the center’s education initiatives are geared towards Kenyan schoolchildren, with the vision of instilling in the next generation the knowledge and respect required for humans and wildlife to co-exist in harmony. To encourage local people to take interest in the project, the center offers greatly discounted admission fees for native Kenyans. The center also runs art workshops for local schoolchildren, the results of which are displayed and sold to tourists at the center gift shop. The proceeds of the gift shop, Tea House, and ticket sales all help to fund free environmental outings for underprivileged Nairobi children. In this way, visiting the Giraffe Centre isn’t simply a fun day out - it’s also a way of helping to secure the future of conservation in Kenya. Of course, the highlight of a trip to the Giraffe Centre is meeting the giraffes themselves. A raised observation deck over the animals’ natural enclosure affords a unique elevated perspective - and the chance to stroke and hand-feed any giraffes that are feeling friendly. There’s also an auditorium onsite, where you can sit in on talks about giraffe conservation, and about the initiatives with which the center is currently involved. Afterwards, it’s well worth exploring the center’s Nature Trail, which wends its way for 1.5 kilometers/1 mile through the adjacent 95-acre wildlife sanctuary. Here, you can spot warthogs, antelope, monkeys and a veritable profusion of indigenous birdlife. The gift shop is a great place to stock up on locally made arts and crafts; while the Tea House offers light refreshments overlooking the giraffe enclosure. The Giraffe Centre is located 5 kilometers/ 3 miles from Nairobi city center. If you’re traveling independently, you can use public transport to get there; alternatively, a taxi from the center should cost around 4,000 KSh. The center is open every day from 9:00 am to 5:00 pm, including weekends and public holidays. Visit their website for current ticket prices or email them at: info@giraffecenter.org.